The lecture provides Quakers and others involved in peace work the chance to hear about how this inspirational work has led to the transformation of suffering into a force for social change. The lecture provides an opportunity to consider peace building as local community work; we have peace work to do on our own streets, and Friends from other Yearly Meetings with experience of this can help us in our work. Worldwide issues of peace, reconciliation, justice and injustice will be illuminated by their healing work. Terry Oakley, clerk of the Swarthmore Lecture Committee. The lecture took place during Yearly Meeting at Friends House, London, 2nd to 9th August 2014 with the theme “what it means to be a Quaker today”. Cécile Nyiramana is the current Clerk of Rwanda Yearly Meeting, having served and worked for the Yearly Meeting in a variety of roles. She founded nine groups of Women in Dialogue, a peace program bringing together widows, genocide survivors and perpetrators wives. Cecile currently works for African Leadership and Reconciliation Ministries (ALARM-Rwanda) as Head of Justice, Peace and Reconciliation. Cecile is a leading peacemaker with established record of promoting human rights and peace and justice. Esther Mombo is a member of Bware Yearly Meeting, Kenya. And Professor of African Church history, Gender and theology at St. Paul’s University in Limuru Kenya. 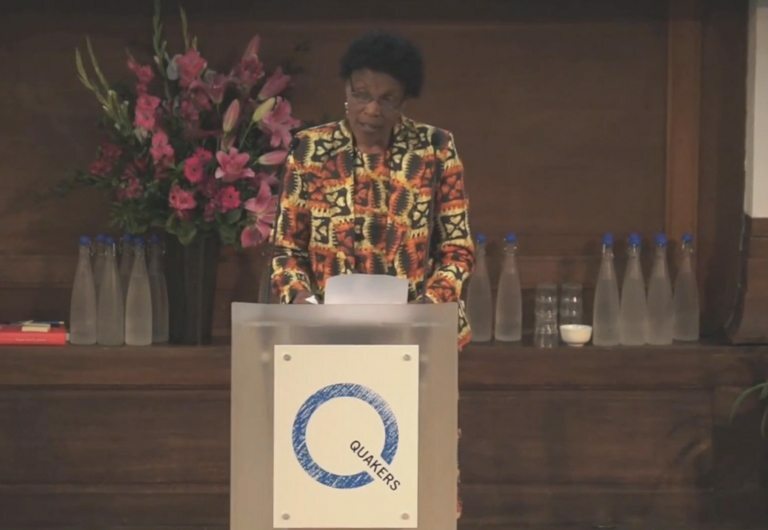 Esther’s PhD (from Edinburgh University) focused on the Development of Quakerism in Kenya with special reference to the role of women and she has received an honorary doctorate from Virginia theological seminary for her work in highlighting issues of gender disparities and gender justice in church and society. Her research and teaching interests span the fields of Church history, with a focus on Mission history, interfaith relations, and theology and Gender studies with a focus on African women’s theology, HIV and AIDS. Esther serves in several ecumenical committees including the Commission of Education and Ecumenical formation of the World Council of Churches and works with religious groups on issues of Gender and women’s full participation in church and society.